As part of our efforts to support and encourage young Australians in study, careers and volunteering in international agricultural research, our International Agricultural Student Awards from Crawford Fund State Committees supported 14 Australian tertiary students to gain international agricultural research experience and expertise. Throughout 2017 and into the early part of 2018, the 14 successful International Agricultural Student Award recipients traveled to their host countries to research and explore their chosen topic areas. The successful applicants participated in international agricultural projects and gained valuable experience in developing countries. Below you’ll find highlights from their reflections and links to their blog pieces. Applications for the 2018 Crawford Fund Student Awards have been received and the winners will be announced in May. 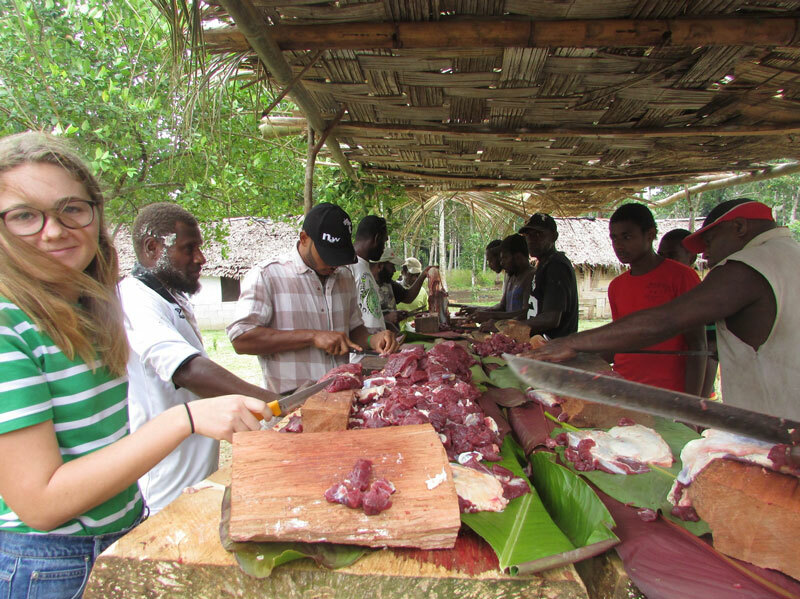 Fynn in Ladi village, preparing meat for a wedding ceremony. Research: Living with your enemy: could sweet potato benefit from the little fire ant? Not only have I been able to utilise this opportunity to positively impact agricultural research in Cambodia and Australia, but the impact on my personal, professional and career growth has been immeasurable and will continue to impact my life as I go on to find more opportunities to work within agricultural research fields. I am immensely grateful and hope to continue to remain associated with the Crawford Fund in the future. “I would also like to express my thanks and gratitude to the Crawford Fund for enabling me to take up this opportunity. It has been incredibly rewarding and enriching, and has really given me more insight into how research is conducted on a global scale and has thus given me more confidence in how I can make a relevant contribution”.